Bangladesh has posted a GDP growth of 7.9 percent in the 2018 financial year (FY) and the country is expected to achieve 7.5 percent GDP growth in 2019 FY with continued strong consumption, industrial growth and public investment. 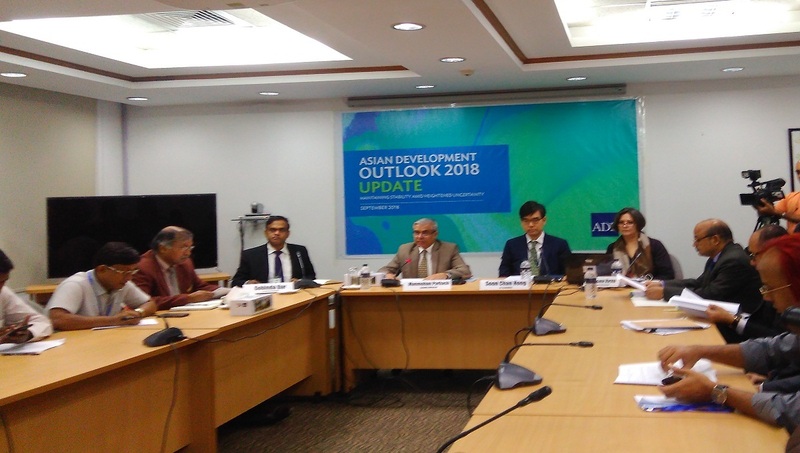 Asian Development Bank (ADB) came up with the projection while releasing an update report of ADB Outlook-2018 at a press briefing held at its Bangladesh Resident Mission conference room in the city on Wednesday. The GDP growth achieved in 2018 FY is highest for Bangladesh since 1974. Bangladesh’s GDP growth, as stated by ADB, slightly surpassed Bangladesh government’s estimation of 7.86 percent GDP growth in 2017-18 FY. That figure was presented before a meeting of the Executive Committee of the National Economic Council (Ecnec) held on September 18. ADB report said from the demand side of economy, acceleration in private consumption, continued growth in public infrastructure investment and private investment contributed to higher GDP whereas, from supply side, growth was driven by expansion in agriculture, industry and microeconomic management. However, according to the report, the performance of service sector was slower in 2018 due to the slower growth in transport, financial, education and health services as well as the country's money supply also decreased from 10.9 percent to 9.2 percent. Besides, the inflation edged up to 5.8 percent from 5.4 percent a year earlier but still ‘under check’. Referring the GDP growth of 2018 as the highest one after 1974, it said, agriculture grew by 4.2 percent which is higher than that of the 2017’s contribution as well as in industry the rate is 12.1 percent which is faster than 10 percent a year earlier. In the following year’s economic projection, it said, along with the continued strong consumption, industry growth and public investment, stable export performance and remittance will also help to drive the growth. In the case of inflation, in 2019 it will be higher with the higher global oil prices, currency depreciation and upward flow of gas and electricity prices. The country needs to continue well management in microeconomic policies, good management in investing, human capital and technologies, he added. If private investment increases and grows faster comparing with the public investment, the country’s economy will grow faster, Prakash said. In the programme, they also placed the present situation of the implementation of 100 million US dollar’s grant for Emergency Assistance Project for Cox’s Bazar’s Rohingya community. Prakash said though Bangladesh’s economy is not in a situation to get grant but considering the request of its government, they approved the grant which is being used in implementing infrastructure development at Ukhia and Teknaf. He also assured that if the implementation would complete in a good and effective way, they would again ask the donors for another 100 million dollars grant for the displaced Rohingya community. ADB’s Senior Economist in Dhaka, Soon Chan Hong, while talking about the impact of trade war between Chain and USA on Bangladesh, said the trade war might not put much impact on Bangladesh but in general it might bring some general impact all over the world economy. The leaders of the bank also assured that ADB would provide uninterrupted assistance like the present time to achieve further economic development in Bangladesh.